Earth Day 2015 is also the first day that the New York State Assembly is transitioning to a paperless system. Assemblymembers have been given iPads to read bills electronically, and supporters say it will save millions of dollars, and trees. Majority Leader Joe Morelle announced the change on the Assembly floor. “Today we begin officially with tablets,” Morelle said. Getting rid of the piles of paper that clutter members’ desks each day required a constitutional amendment, which voters approved last fall. The driving force behind the change is not a coalition of liberal environmentalists, but rather a conservator leaning and minority party Assemblyman, Republican Jim Tedisco, who represents parts of Schenectady. Tedisco happily gave a demonstration of the new format, which is housed in iPads attached to everyone’s desk. One of Tedisco’s own bills popped up, a measure to allow parents and their children to opt out of the Common Core tests. 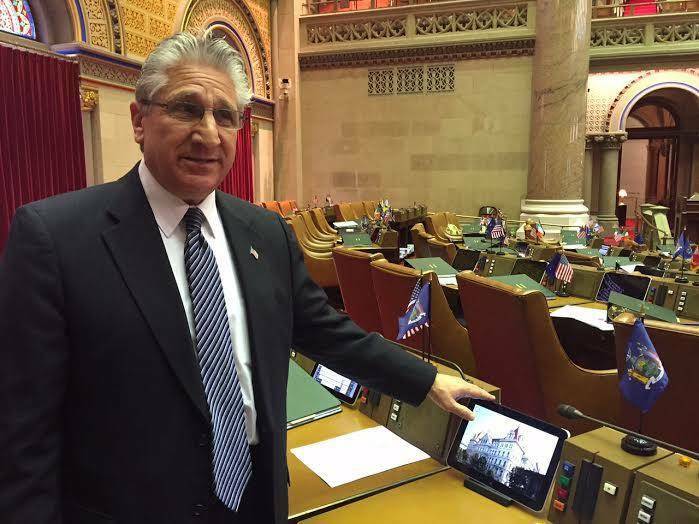 The tablets connect directly to the Assembly’s data base of legislation, showing bills that are introduced and their status, as well as the agenda for committee meetings and a catalogue of New York’s laws that have already been approved. It does not connect to the Internet, though, says Tedisco. Assembly Speaker Carl Heastie, who took over installing the new system when he became Speaker in February, says it has multiple benefits, including reducing the wait time late on budget night when lawmakers are idled while all of the bills print. And the Speaker says, jokingly there’s yet another positive outcome. “We don’t have to hear Assemblyman Tedisco complain anymore at the end of session that he can’t see over his stack of papers,” Heastie said. Tedisco says the change will save money in paper costs, and preserve trees, and it might actually get lawmakers to more fully read and comprehend complex budget and other bills. For now, the Assembly will be using both systems, paper and electronic, in case there are any glitches. But the first day of the digital system went smoothly, and it’s expected that all of the paper will be discontinued by the time the new legislative session begins in January. Tedisco says his next goal is to end the practice of franking, the mailing of letters and flyers to constituents. They would be replaced by notifications through email and Facebook.